1. Beach Cover Up: I got some good progress done, I started the back and knitted about an inch. See the arrow? See all the loose yarn and slipped stitches? Who was responsible? GUILTY: my lovely pack of bratty canines decided to have a little fun with my knitting bag. Yes...my fault for leaving it within reach...so I will be starting over again this week! I can't stay mad at them! 2. Cheese Making: SUCCESS!!! I made my second batch of Mozzarella and it was amazing! Please read the whole post on Rainy Day Cheese Making if you're interested! (I'm so happy about this batch!) 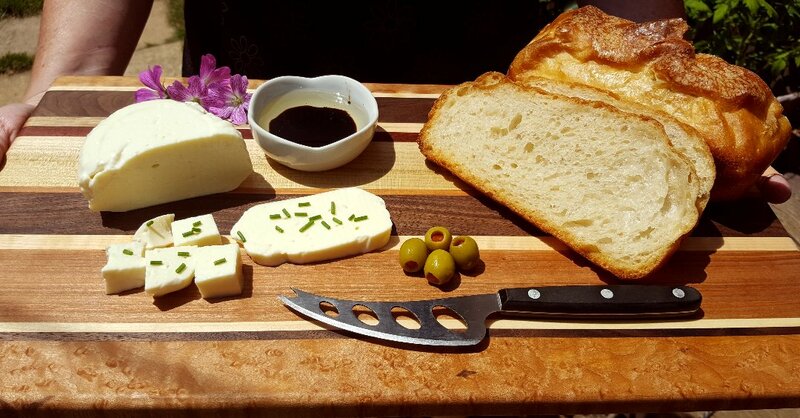 We put together a little plate with some homemade bread and sprinkled fresh chives on the cheese - oooh la la! My Cheddar adventure begins this week! I'm just waiting on a 12-quart pot that I ordered - I neglected to even think that my 6-quart pot (5.6 liters) was too small for anything, but each batch of Cheddar requires 2 gallons (7.5 liters) of milk plus other stuff...(Dianna, you might want to note that!) I had to return an 8-quart pot I bought last week because it would have been a little too small. Those are my two summer projects and I'll post my progress weekly. On to the garden! 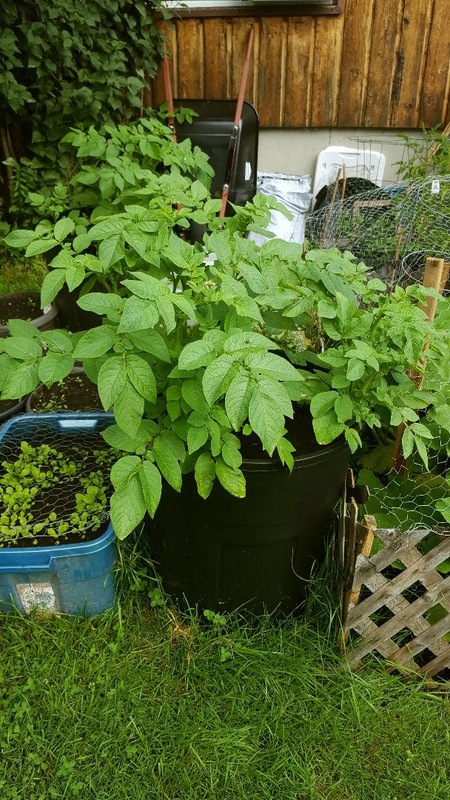 Check out my garbage bin potatoes! This is one of the bins and the other is behind it..they are really growing tall. I "hilled" them as much as I could, so now it's the waiting game! 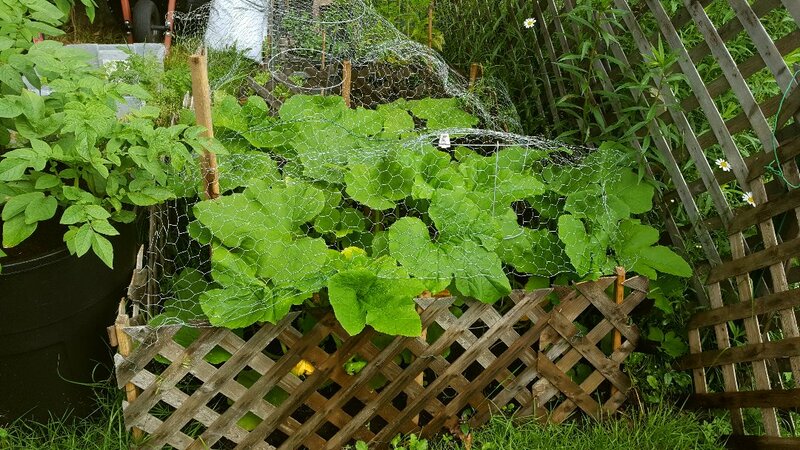 The pumpkin patch is also thriving! It's not too visible but the plants are starting to flower, I can't wait to see some pumpkins! BUBKIS: officially definition of bubkis: nothing, lame, goofy; all of these apply! Either they have stalled or I'll get nothing at all. The rectangle bin with the third round of lettuce is doing well though! All of my other plants are slow to grow. My tomato plant's leaves are turning yellow...way too much rain and not enough sun this summer. I will have to build "umbrellas" to protect them from now on. The Romas look so sad... :( But my herbs are thriving...I take the good with the bad! 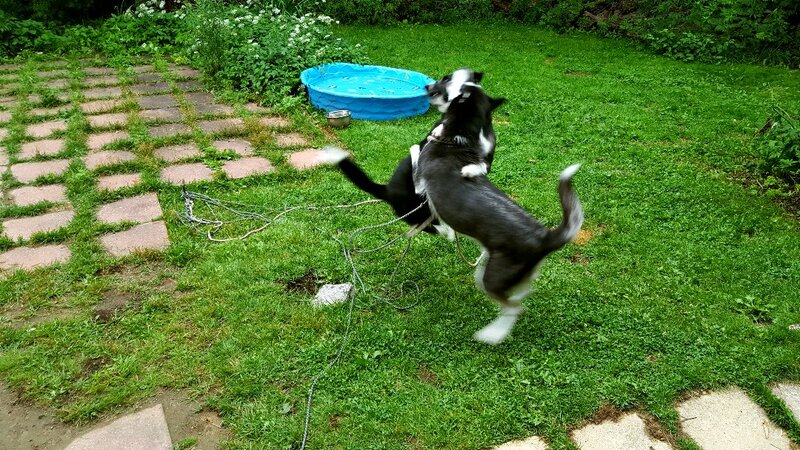 Aah, young love :) Our husky Charlie has taken a real shine to our house guest Pavlov. She was kind of a loner for a while, but when Pavlov came to visit, she brightened up so much and the two of them are joined at the hip, always playing and wrestling. Our friend is coming over on Monday for a few days; and we'll see if he decides to take Pavlov home with him or not. There is a small chance he'll leave Pavlov with his mom Stella for the summer while he gets his life more organized. I have to admit, a small part of me would love the rest of the summer with FIVE dogs in the house! I know Charlie would! So neat that you made cheese! So much fun at your place with all these goodies! And I love your dogs. They are beautiful! My favourite breed has always been the husky. 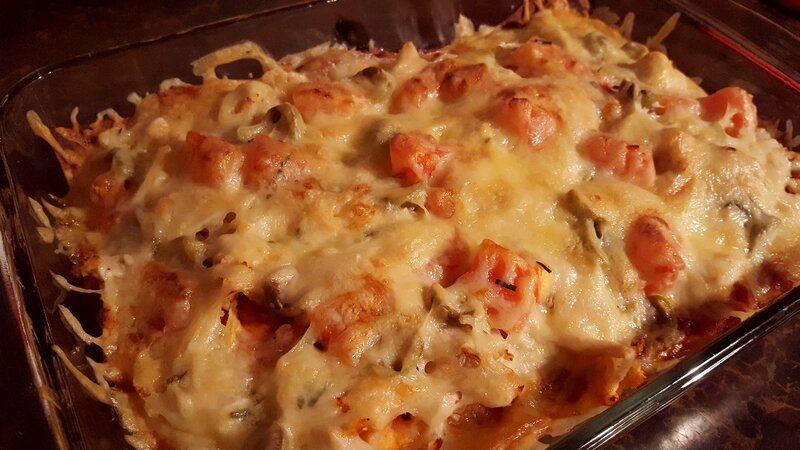 Hi Rain, Good to follow the updates.The dogs look great and so do the enchiladas. 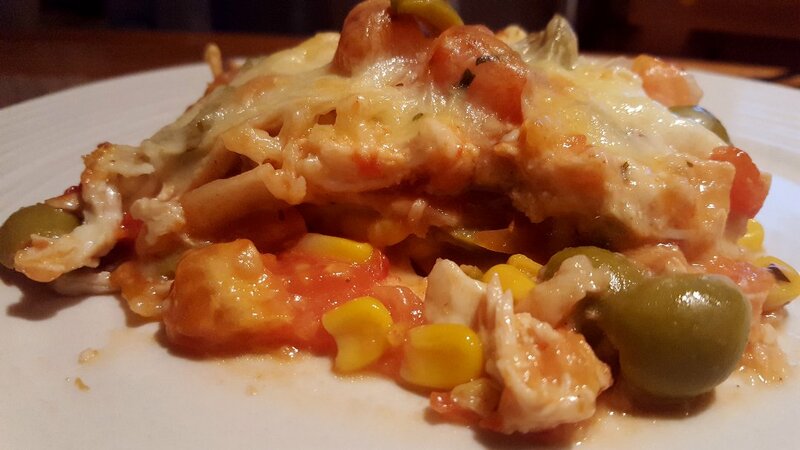 Keep it up with the cheese-making. It's the only way to improve. Already it looks fab. the cheese looks wonderful! i have yellow leaves on my tomatoes too. we have had so much rain it is no wonder! those pups look guilty! That cheeseboard looks very delectable! Well, it was a start....I had a disappointing YOP week too....I haven't posted yet but live and learn. 10 steps forward and 20 steps backwards....story of my life! LOL! Look at your garden though! The deer have eaten my tomatoes, my cilantro died off, the radishes produced nothing but red roots but the flowers are doing great! LOL! 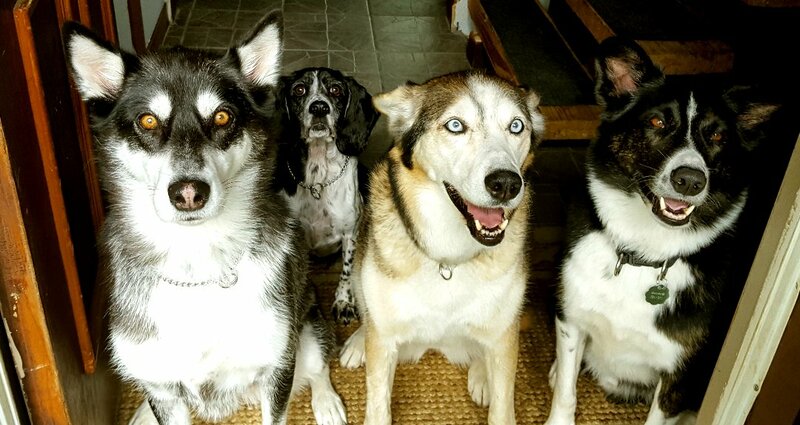 The picture of all the dogs is hysterical....Jack looks a little guilty there in the back...they are all so sweet and what a great picture of the 'family'. Look at you with the cheese making! The bread and the cheese look like out of a magazine! We are all so lucky you blog! Enjoy your company this week! I'm thinking there will be no stopping you when it comes to your cheese making. What a fantastic start you already have. What do they call people who design and lay out food for magazine or book spreads? Which one of you is a professional? You shots of your cooking endeavors always look as though they could be in a food magazine. Don't be discouraged regarding any of your gardening efforts. Not only are you getting some good food but you're learning A LOT which will make your garden better next year. I'm surprised it wasn't the kitty cats that did damage to your knitting. Did you see the culprits in the act? That cover-up is going to be gorgeous and we all expect you to model it for us. I love that Charlie has another dog as her "own!" Maybe Pavlov will be there for an extended stay? Charlie votes for that! Too bad about the cover up but................I am with you............can't stay angry at those pups with the cute adorable eyes. I am fascinated with your cheese making. The mozzarella looks so yummy. We are huge cheese lovers in this house. All types of cheeses too. Nice gardening too. You will have some lovely eats this year. I'm in awe of how much you're able to accomplish! The cheese looks so delicious. Fresh mozzarella, what a dream! I can see why you can't stay made at the brat pack for long. Cuties! Your pictures of your cooking and garden and cheese are delicious (and now I have to go get something to eat). You made Mozzarella? Now I really MUST look into cheese making, I love Mozzarella! Look at those adorable puppy faces... I'm sure they didn't mean any harm as they pulled out your knitting. Perhaps they just thought to remove a distraction so that you could focus solely on them? glad you started knitting but sorry that your loved ones spoiled it bit. they look gorgeous army together . Oh your garden! Sorry about all the rain. We are the complete opposite. Too much sun and little to no rain. I have been watering lots and I saw yesterday that I have small pumpkins forming on one of my plants. The patty pan squash had little ones but they fell off - so strange. The grackles are eating all my raspberries and everything else is growing like gangbusters....lots of sun does that to plants. Something ate my swallowtail caterpillars off my parsley but I see there are some larvae starting out again. Some have moved to my dill so hopefully they will be better hidden away from their enemies. Congrats on the cheese! Awww dogs...they are beautiful!! So hard to stay mad at those faces! Nice garden and dogs. Glad the cheese is working out. Thanks Joyce :) The pups were guilty...but yeah...who can blame them? It's a loose string!!!! Fun!!! Hi Jenn :) I did something radical and I pruned all the yellow branches off all my tomato plants. We've had sun the last few days so I let them dry out slightly, and they'll get some water today. I hope it works. We all have had too much rain so far this summer. Thanks Debra :) It's very easy to eat! Hi Sam :) I have to mosey on over to your blog, I have lots of catching up to do! Oh no...I'm so lucky the deer don't venture this far into the village. They have the community garden to loot so they usually leave our backyards alone. But I did find footie prints in my cherry pots. They really looked like deer after the beets and carrots...but I had the chicken wire on top. I wish I had a trail cam at times like these! My cilantro basically died out too, or just one sprig grew. I kept replanting though and they seem a little more hardy with the sun now. And thanks for the compliment!! :) You're so supportive!! I hope we both have a better YOP week!!! Thanks Nancy :) Yes, you can't stay made at Coco and I can't stay mad at the brat pack...they just give you those eyes and you melt...if only we could forgive people so easily huh? Enjoy your visit! Hi Mama Pea :) I did catch the brats in the act! And my innocent little angel Jack was the instigator...he loves to play with anything and he got into the bag and suddenly it was a potential tug of war...needles and yarn flying everywhere lol...if the cats got into it, I would never have found it! They like to hide things. Well, as you read, Pavlov is gone, sigh. But you know, our pack is back to normal now and maybe we can get back to our normal routine. I stopped walking them in the mornings and we would walk them after dinner. But I missed my morning walks so I'm looking forward to that again! Oh and thanks!! !...actually it was Alex who put the cheese board together! He said we needed some colour for the photo I'll be posting so he picked those flowers. :) The garden...I won't be discouraged! I've already learned that all the plants I started indoors were the ones that were the most successful. 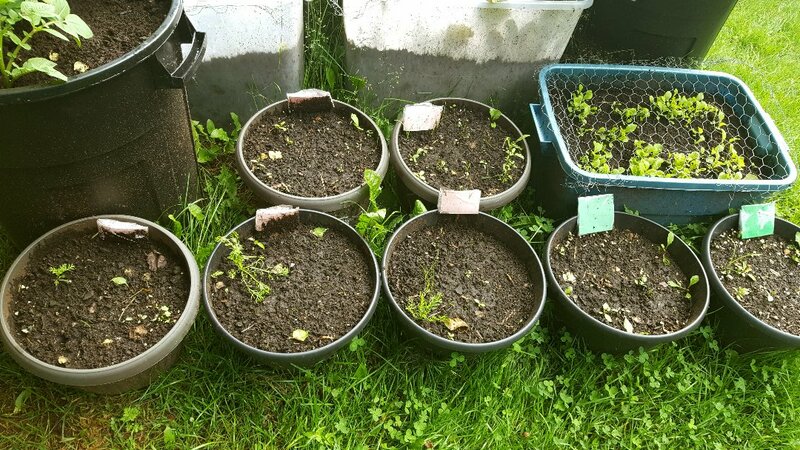 I have to find more room for seedlings next spring! Thanks Marsha :) The cover up...I already started again, it's just such a pain for me to cast on, I hate that part!! :) We love all kinds of cheese. I can't wait to get into the more complicated stuff...but I need to perfect the less difficult cheese first! Hi Rachel! Nice to see your comment! :) I have to catch up on your blog! Ha ha, I guess it's easy when you have one dog, they are the guilty party, though they'll have you believing the opposite lol. Thanks for the compliment! The Mozzarella turned out so yummy! Enjoy your week too! Hi Mary-Anne :) I'm glad I got your appetite going lol...the brat pack are a bunch of cuties...and they convinced me they didn't mean it lol. Hi Ella :) Oh, it's really easy once you get the hang of it! You just need to have the right equipment and a few ingredients and it's such a rewarding result!! I'm sorry about the cover up, but who can blame those faces! At least you hadn't got that far. The cheese looks delicious. I come from a town very close to Cheddar, so I shall watch your cheddar making with interest. Hi Nik :) Oh thanks, the cheese worked out so well! And it's pretty easy to make too. Yeah, the little doggie guilty yet "I love you mommy" faces are hard not to resist! Hi Baili :) I like that you call the dogs a gorgeous army! :) Thanks for the well wishes :) I'm really enjoying the cheese making the most! Hi Dianna :)) Yeah, the casting on for me is the part I don't enjoy so it's hard to start any knitting over! I'm not very skilled at picking up dropped stitches, though I looked it up on You Tube, it was way too far gone at that point. I really thought the 8 quart pot would do it, but I keep forgetting that 8 quarts is not 8 liters...it's less so if you add the water that dilutes the rennet and citric acid, you'd have an overflow. 12 quart pot has arrived so I'm hoping that'll work well! Thanks Jenn :) No, the anger lasted maybe a second or two when I discovered the knitting, but then they're so goofy and guilty, they just made me laugh so they were quickly forgiven! Hi Susan :) Innocent INDEED lol...I thought about waiting to make the cheese until the fall because the Cheddar alone requires 4 hours in the kitchen for the making step. I'm going to see if the weather gets a little cooler after sun down and maybe start that tonight. When Alex and I buy our place, we'll be hiding lol...but if anyone stumbles across us, there'll be Cherry Bounce and cheese to snack on! Hi Lucy :) One thing I used to do was simply give up if I dropped stitches or had to start over, but the group is encouraging me to start again, so I'm very grateful :) Oh...you live near Cheddar...now I feel the pressure lol! Thanks Leigh :) The cheese making requires my patience and much more practice, though I think I've got the fresh Mozzarella down pat now. We are now one less canine, our little guest went home yesterday, sigh...but three is a good number!